I moved in with my host family two days ago, and everything has been going really well so far. It’s funny, I had been totally preparing myself to be placed way out in the middle of nowhere with absolutely no modern amenities and I ended up in a large house that not only has an indoor toilet and hot water but also has wi-fi and a playstation. 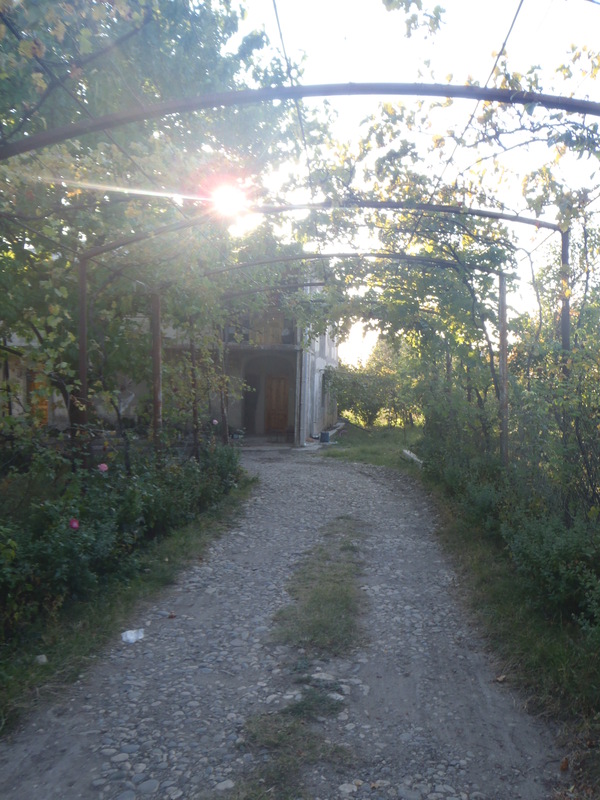 I am located less than 15 miles outside of Tbilisi in a small village named Vaziani. Despite being close to the capital it is pretty rural here. My host family has apple trees, peach trees, grape trees (vines? I don’t know), a large garden, two cows, chickens and a big guard dog named Simba, that I haven’t fully won over yet. 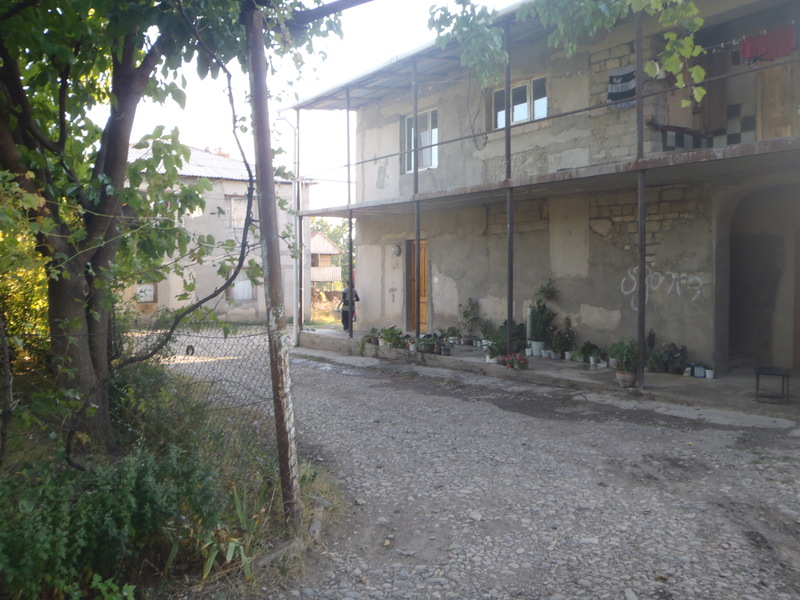 There are six people living in the house, a mother, father, two sons in their twenties, a thirteen year old daughter as well as the wife of one of the sons. In Georgia it is expected that families live together. When a son marries, his wife moves in with his family, and I think that they only move out when they have kids of their own, but that may not even be the case. All the generations spend a lot of their free time together, right now five of us are watching Georgian Idol in the living room. Everyone has been very nice and accommodating, when I arrived at the house around two in the afternoon on Friday the family had a bunch of really good food prepared. Me and the host father took a bunch of shots of vodka together and he made a number of toasts about America, Georgia and friendship. The family members speak a very limited amount of English, so communication has been pretty difficult, but we have managed. On the upside I feel like I will learn more Georgian than I would otherwise. In the last two days I have only spent about thirty minutes speaking in English, but hey, it’s all part of the experience. It is nice that I am so close to the capital and will be able to take a short marshutka ride (it’s like a mini-bus) in to the city on the weekends where there are a lot of other English-speaking volunteers. Tomorrow I start my first day of teaching. Since I haven’t been able to talk to anyone I really don’t know what to expect. I hope I don’t just get tossed in front of a class of forty students with out any preparation, but I feel like that may just be the case, haha. 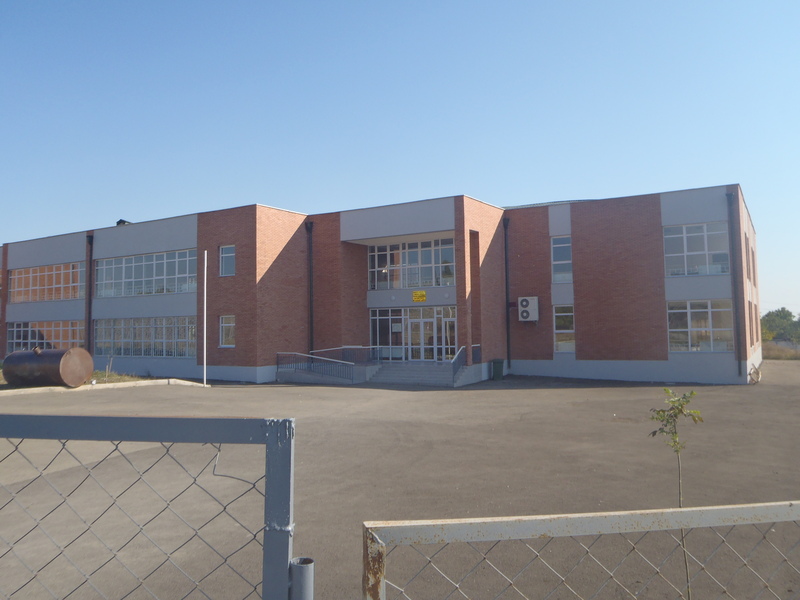 The school is about a three minute walk from the house and was built within the last year, which is awesome. I walked around the village for a while today, and will post those pictures below, along with a few more from the training. My School. It was built last May, apparently the President was there to open it and promised that he would bring an English speaking teacher there. 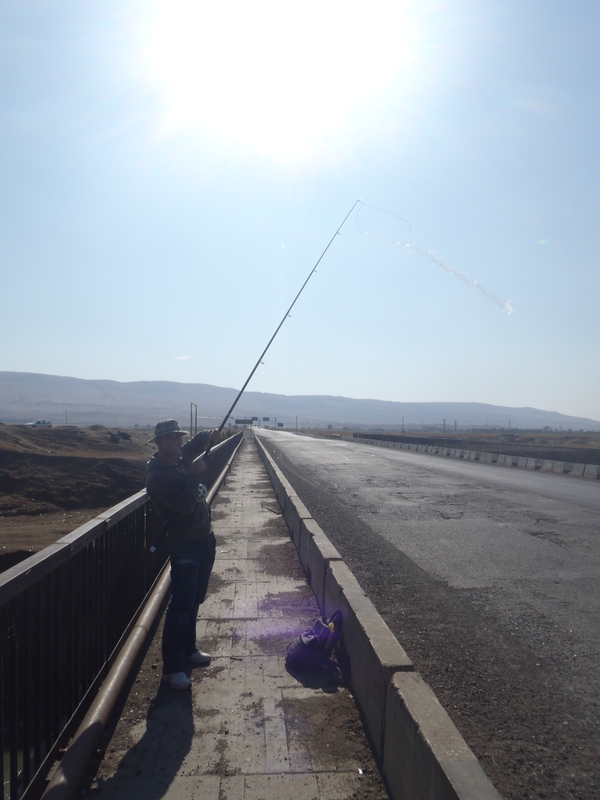 Fishing with my host brother Avtandil who is in the Military Police. They use a big net at the end of the line instead of a hook. 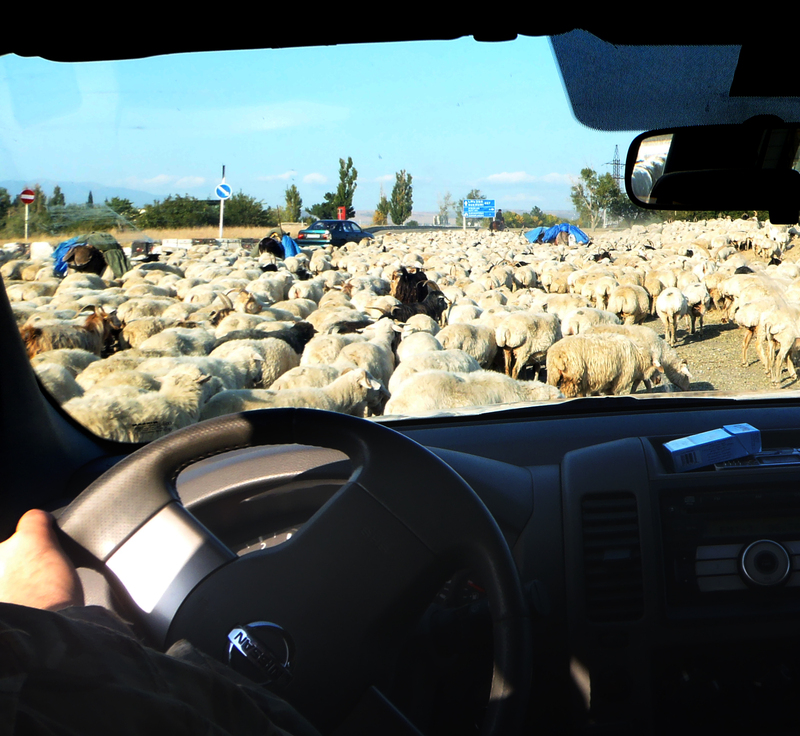 Traffic jam on the way back from fishing. A dog you haven’t won over? That’s a first! I’m sure he’ll be your buddy in no time. Glad to hear your host family is so nice and that you have good accommodations! What an exciting culture shock! I hope you’re having a great time! I love that they have Georgian Idol. haha. I’m glad everything is going well. Take care!